Tunku was born on February 8, 1903 in Alor Setar, the capital of the State of Kedah. He is the seventh prince of Sultan Abdul Hamid Shah, the twenty fourth Sultan of Kedah, and Che Manjalara. Said to be a robust and bright boy with a particular fondness for sports, Tunku received his early education at the Debsurin School, Bangkok and Penang Free School. On a Kedah Government scholarship, he went on to study at St. Catherine's College, Cambridge University, where he received his Bachelor of Arts in law and history in 1925. A firsthand experience in racial discrimination with the college's administration was said to have intensified his conviction in fighting for equality and ignited his desire in making his homeland an independent state, free from British colonialism. His leadership flair also unfolded in England. Realising the Malay students there were not represented by any organisation, he established the Kesatuan Melayu Great Britain (Malay Association of Great Britain) and became its first secretary. After returning home, he joined the Kedah Civil Service as a cadet in the Legal Advisor's Office, and then as a district officer in several Kedah districts. He proved unpopular among some British officials thanks to his outspokenness and tendency to introduce reforms in his quest to improve the living standards of the people. His attempt at completing his law studies at the Inner Temple in England in 1938 came to a halt due the outbreak of the Second World War. He resumed his studies eight years later and came home with his legal qualifications in 1949. The political awareness he gained while making friends with people from various nations in England did not go to waste, when he was made chairman of the United Malays National Organisation (UMNO) soon after his return. On August 26, 1951, Tunku became the UMNO President succeeding Dato' Onn Jaafar. He travelled all over the country meeting people from all walks of life to promote unity. His efforts in overcoming the country's political problems by way of cooperation among the various ethnic groups saw the birth of the Alliance Party in 1955. Under his leadership, the Alliance won the country's first general election in July 1955. 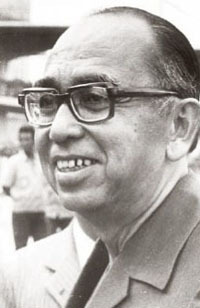 Tunku was then appointed the country's Chief Minister and Minister of Home Affairs. In 1956, he led a mission to London for a discussion with the British government concerning the independence for Malaya. The meeting resulted in the signing of the Independent Treaty at Lancaster House in London on February 8, 1956 and consequently, the independence of Malaya in August 31, 1957. Tunku was then elected as the first Prime Minister of Malaya, and led the Alliance to victory in the 1959, 1964 and 1969 general elections. Tunku Abdul Rahman became the first prime minister of the Federation of Malaya from 1957 to 1963, and of Malaysia from 1963 to 1970. He loved football and horse racing so much that he made them as his hobbies. Under his initiative, "Pesta Bola Merdeka" was born in 1957 which led to his appointment as the first President of Asian Football Confederation (AFC). "Whatever the sport, I was a very keen sportsman. I have always been an outdoors man, a lover of all the wild things in life." Tunku has been married at least three times. With his first wife, Meriam Chong, Tunku was granted two children; Tunku Khadijah and Tunku Ahmad Nerang. Meriam Chong, however, died of an unfortunate medical mishap not long after giving birth to Tunku Nerang. Tunku later married to his former landlady, Violet Coulson, who he met when he was studying in London. Tunku's marriage with Violet however was opposed by the Ruler, Tunku Ibrahim. Their marriage did not last very long as they later divorced. They had no children together. Finally, Tunku married Tun Sharifah Rodziah in 1939. Tun Sharifah was the younger sister of Syed Omar Barakbah, Tunku's college friend when he was studying in London. 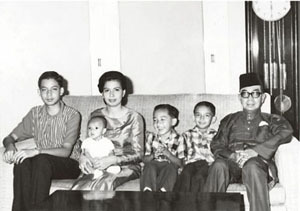 Tunku and Tun Sharifah did not have a child together, but they adopted three children; Faridah, Sulaiman, and Mariam. Tunku and Tun Sharifah were loving parents to all five of Tunku's children. "Let us in this hour of our triumph remember those who have given their lives to enable us to enjoy ours, and let us thank those who are even at this hour spending their time in the jungle, so that we can peacefully celebrate our Merdeka. Let us always remember with gratitude what is being done by the members of the Security Forces whose valour and service to the country have helped to make large areas in this country "white", and people free to go about their business without restriction. The first anniversary of our independence is indeed a memorable one, and I pray that it will be the same next year and all the years after. To those people who have given their co-operation in the service of this country, I say the nation owes you a debt of gratitude. Let this country be an example to the rest of the world on how the various people of different races, with different creeds can live as one people, at peace with one another for the good of all. To Allah we give thanks for the blessings which we now enjoy." An Excerpt from Tunku Abdul Rahman's Speech, "Merdeka: The First Year", 30th August 1958. THE most significant components that make Malaysia what it is today was introduced during the tenure of the second prime minister. In spite of a brief tenure, many attributes of Malaysia  social, political and economical  were Tun Abdul Razak Husseins handiwork, an achievement emulated only by Tun Dr Mahathir Mohamad. Given the alias of Bapa Pembangunan (Father of Development), Razak charted the development of the nation physically, politically and socially  the after-effects of which are felt and witnessed to this day. Townships spruced up during his time, including Petaling Jaya, the countrys first satellite town. The country embarked on an agriculture revolution, which saw it becoming the worlds largest producer of rubber. The Rubber Industry Smallholders Development Authority (Risda) was established for this purpose, while another natural resource  oil  was exploited to the maximum, with the setting up of Petroliam Nasional Berhad (Petronas)  which is today a Forbes-listed entity. The electronics industry also saw tremendous growth, with Malaysia becoming a main manufacturer of electronic components. Razaks development policy that has come to be known as the Red Book is the foundation on which the nation was built. The New Economic Policy (NEP), introduced in 1971, has helped many bumiputras escape a life of poverty  although it is today criticised for creating loopholes that allow the policys principles and spirit to be hijacked by the rich to become even richer. The NEP was Razaks way to eradicate racial distrust that came to a boil during the May 13, 1969 racial riots  an incident which accelerated Razaks journey to the top. The tragic event resulted in the suspension of the Constitution and the birth of the National Consultative Council, which Razak headed. His political legacy includes the Barisan Nasional, which was founded in 1974 to replace the Alliance. It was also Razaks simple yet demanding conditions for a clean and efficient administration that set the standards for the civil service which even today, the civil service struggles to achieve. He was a politician and civil servant who understood well the need to be circumspect. Upon discovering that it would cost RM30,000 to build a swimming pool at his official residence, he had to disappoint his children. What would people say? he reasoned. His eldest son, Datuk Seri Najib, is today deputy prime minister. As director of operations of the National Operations Council (NOC) that ran the country after the May 13 riots until 1971, and because he abolished local council elections in the 1970s, Razak was often perceived as being authoritarian. But this, writes Datuk P.G. Lim is far from the truth. She was one of two women appointed to the National Consultative Council under the NOC. Tun Razak assured members that they had the right to say what they thought. The government would not disregard their views, Lim wrote in an essay published in Tun Abdul Razak, A Personal Portrait. » Local government elections abolished.